Once I thought I had solved the problem of limiting the run of the torpedoes, i hoped to convert to rechargeable batteries. 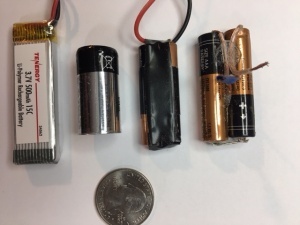 I could not find rechargeable AAAA NiCad batteries, so decided to use 3.7 v LiPo batteries for the power. I had also looked at 3 v Lithium batteries, but preferred that the batteries be rechargeable. This photo shows the various batteries used or considered for use in the torpedoes. The AAA s are on the right, the AAAA next and the rechargeable LiPoly 3.7 v on the left. The LiPoly battery is a bit longer and that required some redesign of the torpedo. Penalty, I guess, for the innate need to tinker, to fix things not broken. 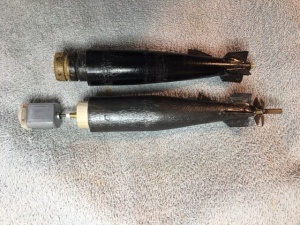 The quarter is slightly larger diameter than the inside diameter of the PVC tubing used for the body of the torpedo. 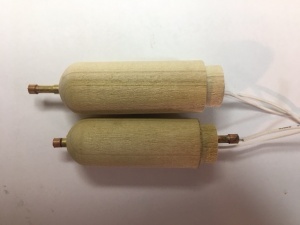 I turned additional wooden parts for more torpedoes, eliminating the long insert and O-Ring grooves in the rear section, to shorten the drive shaft. I also lengthened the nose section and shortened the center PVC section. The plan was to hollow out the nose section a bit more and use it to hold both the switches, as the longer battery and the motor would take up most of the room in the PVC section. On the left are two first run nose cones with slide switches installed, shown in open and closed position. After some trials, I shortened the slides by half so they did not protrude into the PVC section. On the right is a comparison of the first generation rear section, with longer insert and O-Ring grooves, against the second generation version, which is identical except for shorter insert. To power the additional torpedoes, I ordered more of the small electric motors used in the first version. These new ones, however, had slightly larger diameter shafts than the original ones I used requiring modification of the polystyrene tubing coupler connecting the motor to the prop shaft. So it goes. See above under “tinkering”. As for the original, the props were cut from 0.016″ copper sheet. I drilled a 1/8″ hole in the center of the discs to be shaped into props and once the props had been cut and filed into shape, I secured them to a shaft of 1/8″ solid brass rod by soldering a length of 5/31″ brass tube in front and in back of the prop. The tubing is about 3/4 ” long forward of the prop, and the 6″ long brass rod has another piece of 5/32″ tubing soldered to the inside end with the tubing protruding about 1/4″ beyond the end of the rod. This arrangement created two bearing surfaces (the 5/32″ tubing) when the shaft is installed in the 3/16″ brass tubing, 6″ long, used as the stuffing box. This also permits light grease or oil to be placed in between the two bearing surfaces when the torpedo is assembled for lubrication and water seal. With the shortened PVC section (to lower weight), the motor and longer battery were a tight fit, but by hollowing out the nose cone almost entirely and placing the switches in the nose, I managed to get everything to fit. The battery comes with JST plug, so I used a JST female connector for that plug, and also a second pair of connectors to allow the switches to be disconnected and the nose cone removed when servicing/charging the battery.